There is an island in the ocean that's lost in the fog and absent from all geography maps. The seafarer suffers a shipwreck and gets washed ashore an island. He attempts to find a way out, as he develops a relationship with the natives. The ultimate objective is to build a ship and leave the island. But first the player must build a house, a boat, and other strategic objects, all the while helping the natives with their problems. The final task is to build a vessel and sail away. 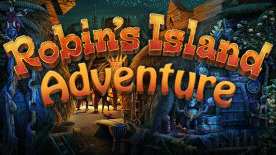 The point of the game is to complete the levels Match 3 and receive access to Hidden Objects and Puzzles, at which point the player can begin to build objects. Robin’s Island Adventure © 2011 1C Company. Developed by Shaman Games Studio. All rights reserved. Unity 4 © Unity Technologies. All rights reserved.